I find my monthly drive to London exceptionally tedious. Which makes me curious about why there's nowhere decent to eat enroute: surely it's a terrific opportunity for small-scale street food establishments to offer quick, well-made dishes that can be speedily prepared and consumed, like the roadside snacks you find along highways in India? Instead, this 300-mile-long street is a culinary desert. Of course there’s nowhere at all to eat on the M1. One of the most shameful images that England offers our millions of overseas tourists is the ghastly processed pap, terrible dry fish and chips, sad wrinkled sausages and beans, dessicated croissants and stringy lukewarm chicken that constitute, along with the thin frozen patties of Burger King, the only hot fare available to hungry travellers on our overcrowded motorway network. These “services”, which should really be retitled disservices, ought to have their licences torn up and their lazy management sent to Siberia because of their exorbitant prices and execrable food – Moto, Welcome Break, Road Chef (Welcome? Chef? hardly!) – they’re as bad as each other. While the standard of restaurant food in Britain has generally moved on apace, these companies are stuck in the gridlock of 1980s mediocrity. Seasoned travellers may protest that I’ve overlooked Tebay Services which, run by a private company, could almost be called charming, with its little duck pond and jolly staff. However no one on his way to London would dream of taking a four-hour diversion to the M6 in Cumbria just for a slice of homemade steak and kidney pie. Instead we brave the A1. Not for me all the ghastly Little Chefs and certainly not the terrible Upper Crust and “Eat and Drink Company” offerings at Moto’s Wetherby services. If I’m hungry I normally hang on till I get further south, to the OK Diner, near Grantham. It’s set across a dark, crater-ridden car park, with glowing signage and an even brighter interior, a small slice of Americana in Lincolnshire. 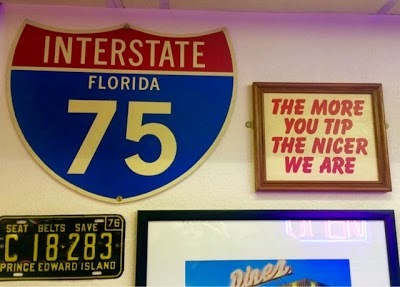 While Junior Diner looks forward to a thick milk shake, Mrs Diner and I order bacon cheeseburgers, medium rare of course, and a Budweiser for whoever’s not driving the final leg into London. A smile? Yesterday this branch (there are eight of them, mostly in the Midlands) found itself clean out of smiles, thanks to a staff member competing for the title of Britain’s Rudest Waiter. 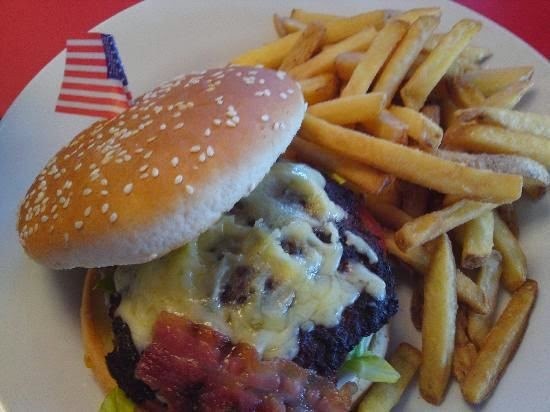 Everything I could say about the food is summed up in two words: American diner-ish. Which, as anyone who’s travelled Route 66 knows, is perfect for most travellers, and a darn sight better than any other A-roadside eatery I've found this side of the Pennines. So let’s pass on the fact that sometimes I've found the breakfast scrambled eggs not quite soft enough, the bacon a touch salty, and accept this eaterie for what it is: a fairly good imitation of a proper American diner. With 50s music. But back to last night’s service: it started badly and got progressively worse. Even though the place was almost empty just after 9pm, with just one other customer sitting alone in a sea of empty booths, I stood obediently beside a sign saying “Please wait to be seated”. After I’d made the automatic doorbell sound 3 times, with all three staff members steadfastly ignoring me, I eventually wandered off on my own and chose a table at random from the 25 or so on offer. Shortly afterwards an unsmiling young man ambled over, long hair swept into a pony tail and, without a word of hello, thanks for dropping by, nice to see you, or would you like a drink, grumpily plonked a menu on the table in front of me. I already knew what I wanted, and opened my mouth to order, but by then he had turned and vanished. I went to the loo, and when I came back there was still no sign of my waiter, so I approached the grill, where, next to a bored chef, stood a waitress, or maybe she was the manager, her head embedded in paperwork. “Is there any service here tonight, or is it do-it-yourself?” I asked as sweetly as I could, through teeth that were quickly gritting up. So I padded across the restaurant, and a few moments later, so did my waiter. “I’d like a bacon cheeseburger, please, medium rare”. I said the last two words quite slowly, to avoid confusion. But he’d stopped listening long before I’d finished. “I already told you, we only cook our meat to 75 degrees, for health and safety reasons,” he insisted, like a cracked 1950s record. Then I heard the chef mumbling something like” “You don’t know what you’re talking about, of course he can have it medium rare”. Precisely nine minutes later, the chef arrived at my table with a perfect specimen and hot, crispy chips. However my burger sat on the table alone, unaccompanied by napkin, cutlery or condiments. After some futile waving, I collared the waitress, who found me a table setting. Later, I asked the waiter why he’d neglected to bring me any cutlery. He said it was because the chef had brought me my food and not him. He sounded miffed. I congratulated him on finding me a medium rare burger. He just sneered. Assuming he might be vaguely interested in the only subject a burger bar employee needs to be really knowledgeable about, I was about to explain Judge Elizabeth Roscoe’s 2013 ruling on the subject of rare burgers, when he muttered something rude under his breath, turned his back on me and stormed off. Not OK.
Later he returned with a credit card machine set to the question Add A Gratuity? I pressed the NOT BLOODY LIKELY button. OK, OK - we’ll see. He was probably tired, underpaid, bored, how inconsiderate of a customer to arrive an hour before closing. But I don't blame this chap at all, for it wasn't his fault. It's indicative of a lack of training in basic hospitality service that this company needs to address if it is to survive. Which I sincerely hope it does, for purely selfish reasons, otherwise there'll be nowhere at all to eat on the journey to London. And I do like a good burger, just as Junior Diner loves a good milk shake. Simultaneously I received another tweeted response from a blogger called Emma Phillips, sharing her own experience of the OK Diner on the A19 near Hartlepool earlier this month. Good food, “brusque” service, was her verdict. So it’s not just Lincolnshire, then. Maybe OK Diner’s staff, in an attempt to secure true authenticity, are trying to emulate the legendary rudeness of waiters in genuine New York diners. If so, the staff certainly shouldn’t expect tips, and this little chain of restaurants, however good its food, shouldn’t be at all surprised if customer loyalty, and as a result, business profitability, are as insubstantial as its waiters’ welcome. Thanks for sharing! I'd love to return as their milkshakes were legendary! If you are able to detour off the A1 there are some great places around there. The best is probably The Olive Branch at Clipsham. It's about 2 miles south and a mile from the A1. Stopped at the OK Diner Northbound at Tickencote a couple of times, friendly staff there.